A lunar module arriving at KSC aboard the Super Guppy, June 1967. At a Management Council Review in Houston, 6-7 August, Low presented the details of the lunar module problems and asked the Houston mission director, Christopher C. Kraft, to look into the feasibility of a lunar orbit mission without a lunar module. Low noted that the KSC work schedule was currently headed for a January 1969 launch and that insistence upon the use of lunar module 3 could result in a delay of up to two months. At a second meeting on 9 August, Kraft reported that the lunar orbit mission was feasible. Debus indicated that KSC could support such a launch as early as 1 December. Only two items remained open: the location of a suitable substitute for the lunar module and the approval of the Administrator, who was overseas at the time. 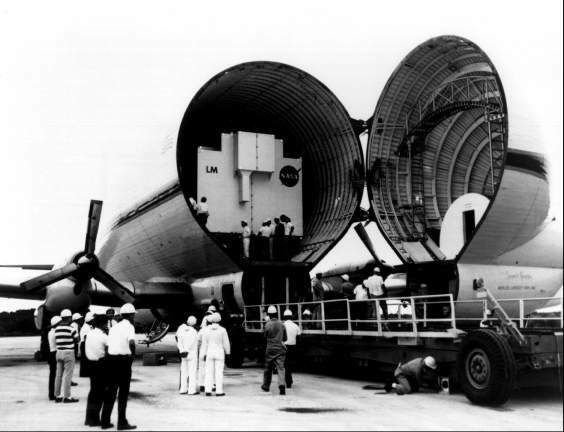 Within three days after the meeting, the command and service modules for Apollo 8 had arrived at KSC. At a meeting in Washington on 14 August, NASA substituted a test article for the lunar module. Since the circumlunar mission depended on KSC's ability to support a 6 December launch, Debus was asked to assess the launch team's chances. The KSC director replied that he had no technical reservations. Although Mueller expressed a reluctance to decide before Apollo 7 results were evaluated, he conceded the necessity of doing so. The overall review of the circumlunar mission plan resulted in an informal "go." KSC's response was immediate and positive: the following day, the spacecraft facility verification vehicle was erected on the instrument unit.